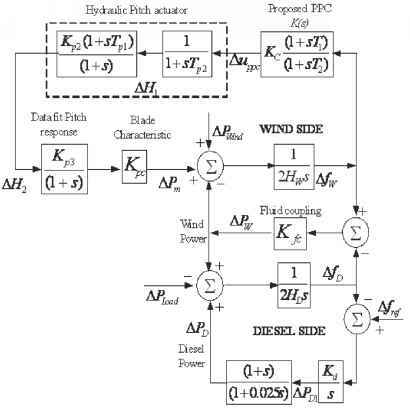 The basic system configuration of an isolated hybrid wind-diesel power generation system as shown in Fig. 5 (Das et.al. 1999) is used in this study. The base capacity of the system is 350 kVA. 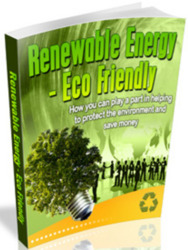 The diesel is used to supply power to system when wind power could not adequately provide power to customer. Moreover, The PPC is installed in the wind side while the governor is equipped with the diesel side. In addition to the random wind energy supply, it is assumed that loads with sudden change have been placed in this isolated system. These result in a serious problem of large frequency deviation in the system. As a result, a serious problem of large frequency deviation may occur in the isolated power system. Such power variations and frequency deviations severely affect the system stability. Furthermore, the life time of machine apparatuses on the load side affected by such large frequency deviations will be reduced. Fig. 5. 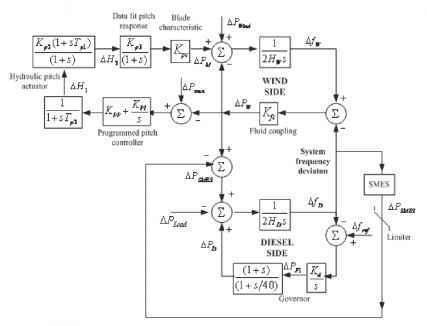 Basic configuration of a hybrid wind-diesel power generation system. Where the state vector AX = [AfW AfD APD1 APD AH1 AH2 APm ], the output vector AY = [AfW], AUPPC is the control output of the PPC. The proposed control is applied to design a proposed PPC K(s). The system in equation (6) is referred to as the nominal plant G.
mm _ max where Z and Zspec are the actual and desired damping ratio of the dominant mode, respectively; a and aspec are the actual and desired real part, respectively; Kmax and Kmin are the maximum and minimum controller gains, respectively; Tmax and Tmin are the maximum and minimum time constants, respectively. This optimization problem is solved by GA to search optimal or near optimal set of the controller parameters. In this section, simulation studies in a hybrid wind-diesel power generation are carried out. System parameters are given in (Das et.al. 1999). In the optimization, the ranges of search parameters and GA parameters are set as follows: KC e [1 100], T1 and T2 e [0.0001 1], crossover probability is 0.9, mutation probability is 0.05, population size is 200 and maximum generation is 100. As a result, "the proposed PPC" is given automatically. 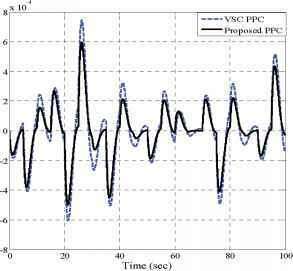 In simulation studies, the performance and robustness of the proposed PPC is compared with those of the PPC designed by the variable structure control (VSC) obtained from (Das et.al. 1999). Simulation results under four case studies are carried out as shown in table 1. Simultaneous random wind power and load change. First, a 0.01 pukW step increase in the wind power input and the load power are applied to the system at t = 5.0 s, respectively. Fig. 7 and Fig. 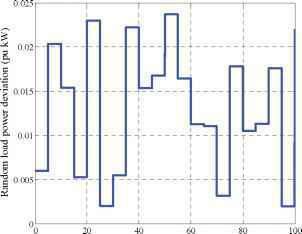 8 show the frequency deviation of the diesel generation side which represents the system frequency deviation. 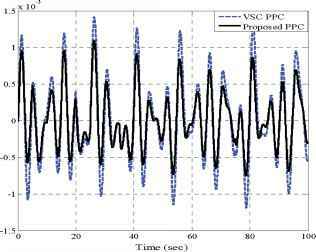 The peak frequency deviation is reduced significantly by both of the VSC PPC and the proposed PPC. 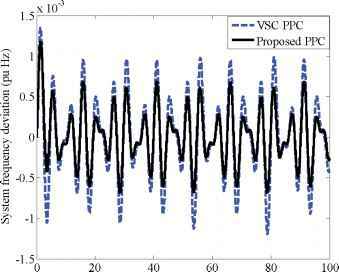 However, the proposed PPC is able to damp the peak frequency deviation quickly in comparison to VSC PPC cases. Fig. 7. 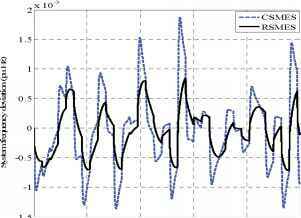 System frequency deviation against a step change of wind power. Fig. 8. System frequency deviation against a step load change. Case 2: Random wind power input. 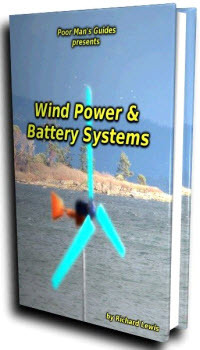 In this case, the system is subjected to the random wind power input as shown in Fig.9. 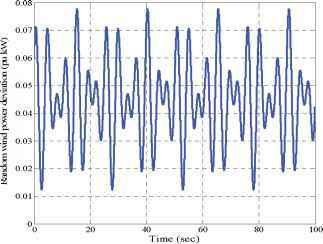 The response of system frequency deviation is shown in Fig. 10. By the proposed PPC, the frequency deviation is significantly reduced in comparison to that of the VSC PPC. Fig. 9. Random wind power input. Fig. 10. System frequency deviation in case 2 Case 3: Random load change. Next. the random load change as shown in Fig.11 is applied to the system. Fig. 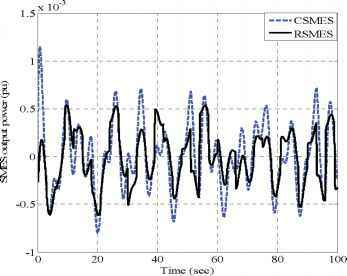 12 depicts the response of system frequency deviation under the load change disturbance. The control effect of the proposed PPC is better than that of the VSC PPC. Fig. 12. System frequency deviation in case 3. Case 4: Simultaneous random wind power and load change. In this case, the random wind power input in Fig. 9 and the load change in Fig. 11 are applied to the hybrid wind-diesel power system simultaneously. 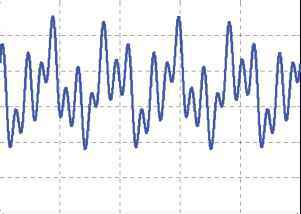 The response of system frequency deviation is shown in Fig. 13. The frequency control effect of the proposed PPC is superior to that of the VSC PPC. Fig. 13. System frequency deviation in case 4. In this study, the system configuration in Fig. 5 is used to design frequency controller using SMES. In worst case, it is assumed that the ability of the pitch controller in the wind side and the governor in the diesel side to provide frequency control are is not adequate due to theirs slow response. Accordingly, the SMES is installed in the system to fast compensate for surplus or insufficient power demands, and minimize frequency deviation. Here, the proposed method is applied to design the robust frequency controller of SMES. Fig. 14. Block diagram of a hybrid wind-diesel power generation with SMES. Fig. 15. Block diagram of SMES with the frequency controller. Where the state vector AX = [AfW AfD APFl APD AH0 AHj AH2 APM ]T, the output vector AY = [AfD ], AfD is the system frequency deviation, APSMSES is the control output signal of SMES controller; A u N =[ A Y ] is the feedback input signal of SMES controller. Note that the system in equation (11) is a single-input single-output (SISO) system. The proposed method is applied to design SMES controller, and the system of equation (11) is referred to as the nominal plant G..
mm _ max where Z and Zspec are the actual and desired damping ratio of the dominant mode, respectively; c and crspec are the actual and desired real part, respectively; Kmax and Kmin are the maximum and minimum controller gains, respectively; Tmax and Tmin are the maximum and minimum time constants, respectively. This optimization problem is solved by GA to search optimal or near optimal set of the controller parameters. In the optimization, the ranges of search parameters and GA parameters are set as follows: Zspec is desired damping ratio is set as 0.4, c pjcc is desired real part of the dominant mode is set as -0.2, and Kmin are Kmax minimum and maximum gains of SMES are set as 1 and 60, Tmin and Tmax are minimum and maximum time constants of SMES are set as 0.01 and 5. The optimization problem is solved by genetic algorithm. As a result, the proposed controller which is referred as "RSMES" is given. Table 2 shows the eigenvalue and damping ratio for norma! operating condition. Clearly, the desired damping ratio and the desired real part are achieved by RSMES. Moreover, the damping ratio of RSMES is improved as designed in comparison with No SMES case. To evaluate performance of the proposed SMES, simulation studies are carried out under four operating conditions as shown in Table 1. In simulation studies, the limiter -0.01 pukW < APsmes < 0.01 pukW on a system base 350 kVA is added to the output of SMES with each controller to determine capacity of SMES. The performance and robustness of the proposed controllers are compared with the conventional SMES controllers (CSMES) obtained from (Tripathy,1997). Simulation results under 4 case studies are carried out as follows. In case 1, a 0.01 pukW step increase in the wind power input are applied to the system at t = 0.0 s. Fig. 16 shows the frequency deviation of the diesel generation side which represents the system frequency deviation. Without SMES, the peak frequency deviation is very large. The frequency deviation takes about 25 s to reach steady-state. This indicates that the pitch controller in the wind side and the governor in the diesel side do not work well. On the other hand, the peak frequency deviation is reduced significantly and returns to zero within shorter period in case of CSMES and the RSMES. 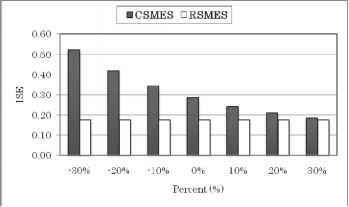 Nevertheless, the overshoot and setting time of frequency oscillations in cases of RSMES is lower than that of CSMES. Fig. 16. 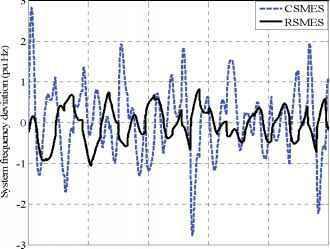 System frequency deviation against a step change of wind power. 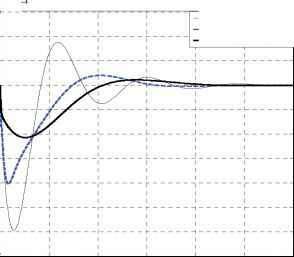 Next, a 0.01 pukW step increase in the load power is applied to the system at t = 0.0 s. As depicted in Fig. 17, both CSMES and RSMES are able to damp the frequency deviation quickly in comparison to without SMES case. 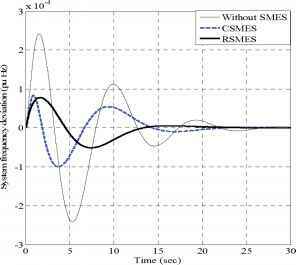 These results show that both CSMES and RSMES have almost the same frequency control effects. Case 2: Random wind power input. Fig. 17. System frequency deviation against a step load change. Fig. 19. System frequency deviation under normal system parameters. Fig.20 shows the values of ISE when the fluid coupling coefficient Kfc is varied from -30 % to +30 % of the normal values. The values of ISE in case of CSMES largely increase as Kfc decreases. In contrast, the values of ISE in case of RSMES are lower and slightly change. Fig. 20. Variation of ISE under a change of Kfc. Case 3: Random load change. Fig. 22 shows the system frequency deviation under normal system parameters when the random load change as shown in Fig.21 is applied to the system. 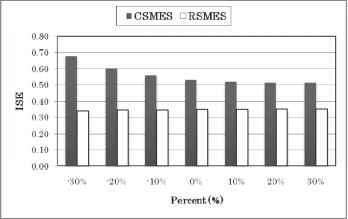 The control effect of RSMES is better than that of the CSMES. Fig. 21. Random load change. Fig. 22. System frequency deviation under normal system parameters. Case 4: Simultaneous random wind power and load change. In case 4, the random wind power input in Fig. 18 and the load change in Fig.21 are applied to the system simultaneously. When the inertia constant of both sides are reduced by 30 % from the normal values, the CSMES is sensitive to this parameter change. It is still not able to work well as depicted in Fig.23. In contrast, RSMES is capable of damping the frequency oscillation. The values of ISE of system frequency under the variation of Kfc from -30 % to +30 % of the normal values are shown in Fig.24. As Kfc decreases, the values of ISE in case of CSMES highly increase. On the other hand, the values of ISE in case of RSMES are much lower and almost constant. 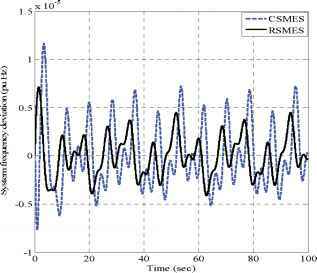 These simulation results confirm the high robustness of RSMES against the random wind power, load change, and system parameter variations. Fig. 24. Variation of ISE under a change in Kfc. Finally, SMES capacities required for frequency control are evaluated based on simultaneous random wind power input and load change in case study 4 in addition to a 30 % decrease in Kfc parameters. The kW capacity is determined by the output limiter -0.01 < APSMES < 0.01 pukW on a system base of 350 kW. The simulation results of SMES output power in case study 4 are shown in Figs. 25. Both power output of CSMES and RSMES are in the allowable limits. However, the performance and robustness of frequency oscillations in cases of RSMES is much better than those of CSMES.